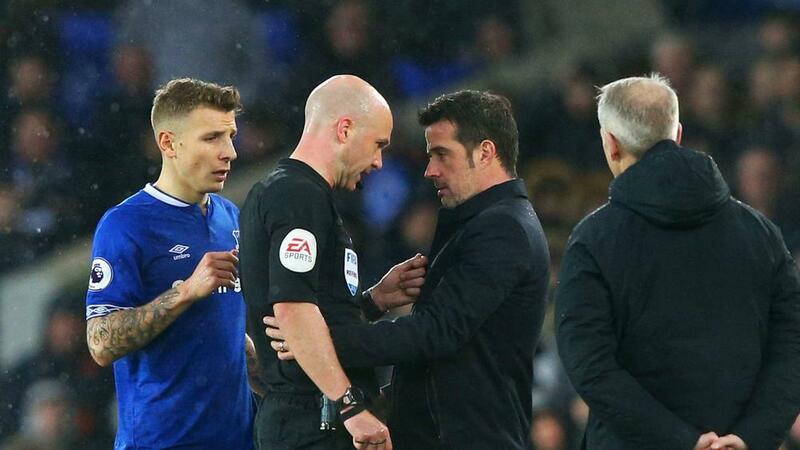 Marco Silva said it was "impossible" for him to be happy with the performance of referee Anthony Taylor in Everton's 2-0 victory over Bournemouth on Sunday. Second-half goals from Kurt Zouma and Dominic Calvert-Lewin sent Everton into the top half of the Premier League, but Silva was frustrated by Taylor's handling of the clash at Goodison Park. Five Everton players were booked as they racked up 17 fouls across the match, while Bournemouth gave away eight free-kicks and received no yellow cards. "I'm sure if you are an Everton supporter this afternoon you are unhappy about the referee, I don't have doubts about that," Silva said. "I'm not a coach who comes here to find excuses, I like to be honest with you all, but this [match] was really tough. "It is not something that has just happened this afternoon, but this afternoon was really strange. It was a bad performance for sure, but in some moments I can have a bad performance. "It is impossible I will be happy with that performance." Bournemouth boss Eddie Howe was similarly frustrated by Taylor, claiming a penalty should have been awarded for Idrissa Gueye's tackle on David Brooks in the first half. Howe also felt Andre Gomes was fortunate not to concede a spot-kick or receive a second booking after a coming together with Jefferson Lerma and a late tackle on Steve Cook. "At the time, I thought the first penalty shout on Brooks probably was a penalty. I haven't seen it back, so I may be wrong," said the Bournemouth boss. "At the end, I've then been told there was a stonewall [penalty], but that's the way things are going for us at the moment. "In terms of Andre Gomes, certainly from my view, I thought the first one could've been a yellow, as well as the second. If you add them together, he is lucky to stay on the pitch. I haven't seen back the one at the end, though. "It's a difficult one to take and one that is similar to our recent run. Personally, I'm really pleased with our performance."